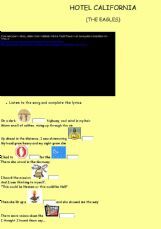 A beautiful song to develop listening skills and a web-search(reading) activity about Jeff Buckley, the singer of A Broken Hallelujah. I couldn�t resist making another online activity about Queen. 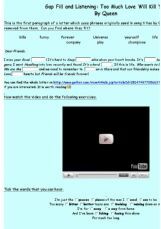 The first activity is a part of a letter which uses song titles. The song is not as famous as the others but just as great as any other Queen song. Have fun. A beautiful romantic song performed by one of my favourite singers. Easy to learn. Relax and enjoy the music. A beautiful song to practice listening skills. I hope your students enjoy it! Your feedback is welcome! Well, I didn�t realize these OE were addictive, too! (What isn�t addictive here?...) 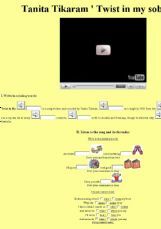 Arthur - a popular series for kids - "Homework" song and exercises. Thanks for your comments, have a great day!!! One of my favourite songs to use with teenagers and adults. 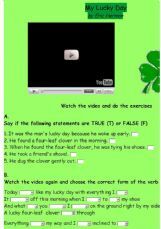 It includes fill in the gaps, multiple choice and right or wrong exercises.